Some brews are sneaky. They confuse the senses, making you wonder what the hell it is you’re drinking. Encore is one such brew. A nice light wheat beer can make for a great summertime refresher, while heavier IPAs offer a little more weight that’s typically not as sessionable. Encore attempts to blend the two with some sassy flair, but while it gets off to a good start, I’m not entirely sure the end result is worth sticking around for to catch a repeat performance. 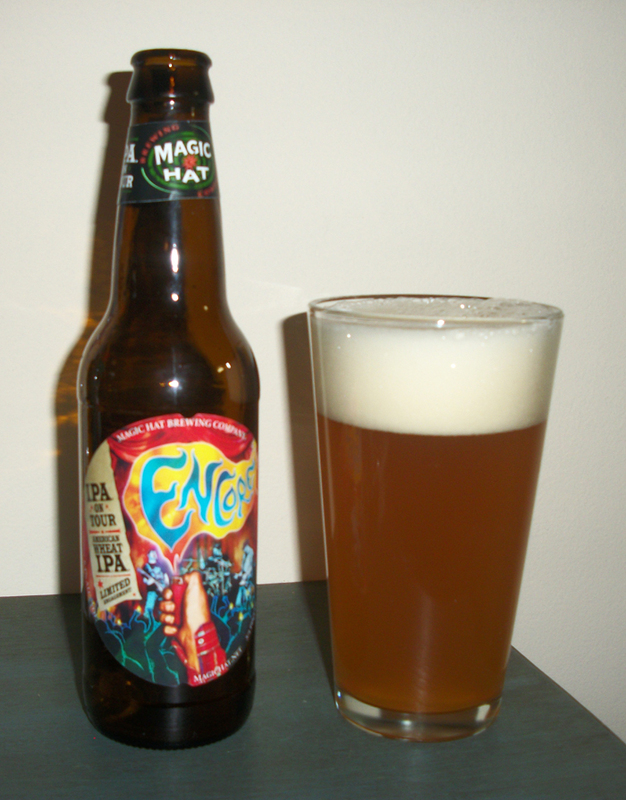 Encore is a limited edition IPA/Wheat Beer hybrid that’s part of Magic Hat’s year-long IPA On Tour series. Yeah, and the 6.4 percent ABV? Let’s rock-n-roll! Appearance – Encore’s medium golden color is muddied slightly by wheaty haze. It sports a thick creamy white head that dissipates ever-so-slowly, leaving ample lacing on its way down. Very nice. Aroma – Simply beautiful. Pungent grapefruit aromas mingle with lots of pineapple and citrusy sweetness that entices the nose. My stomach is rumbling. Let’s do this. Taste – Hopheads will definitely feel teased, as there’s less hop aggression on the palate as is suggested in the aroma with this one. Caramel sweetness and a hint of grapefruit give way to wheat and pine which stick around for a bit on the tongue. The hops are present but subdued, letting the wheat take over a hair in the finish. Overall– Encore gets off a to a bold start but flounders a bit in the flavor department. That’s not necessarily a bad thing for more casual imbibers. This beer is very drinkable, save for its high alcohol content, but hop addicts will find it lacks that sustaining punch they crave from a good hefty IPA. This entry was posted in Beer Nerdistry and tagged beer, beer nerdistry, beer reviews, craft beer, encore, freelance, geek, magic hat, nathan meunier, nerdy beer, Review, writing by nmeunier. Bookmark the permalink.